So much for those allegedly strong Christmas sales. In fact, sales of nearly everything were down in today's Commerce Department Retail Sales Report for December 2014. 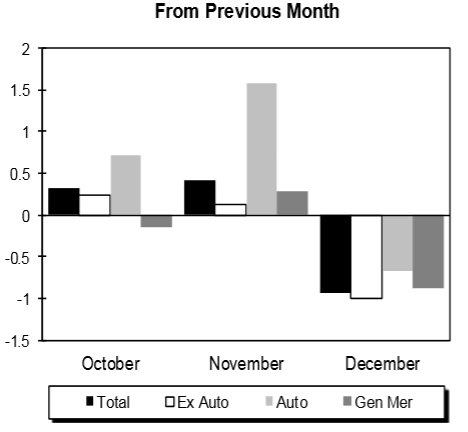 Month-over-month retail sales, autos, general merchandise, and ex-auto sales are all lower. The report shows store retailers down 1.9%, building materials & garden supplies down 1.9%, electronics & appliance stores down 1.6%, motor vehicles and parts down 0.7%, and general merchandise down 0.9%. Food services and drinking was up 0.8%. Home furnishings posted a 0.8% gain as well. Gasoline was down 14.2%. 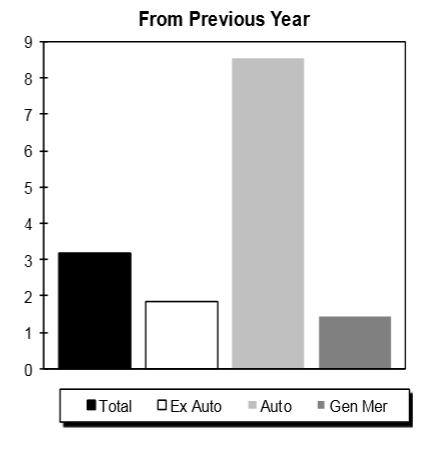 Take a good look at autos, one of the key drivers of overall sales growth for the past year. Commerce reports "auto and other motor vehicle dealers were up 9.8 percent from December 2013, and food services and drinking places were up 8.2 percent from last year." Once again economists were surprised when they should not have been. Please consider a few snips from my January 6, 2015 report Economists Upbeat Despite 4th Consecutive Decline in Factory Orders; Auto Orders vs. Expectations. Nonetheless "Auto sales are expected to reach their highest level in a decade this year, bolstered by strong job gains and cheap gas." The factory order evidence was right there, staring economists in the face, but they could not see it. Link if video does not play: Gomer Pyle on Surprises. Hmm. What happened to the theory that consumers would take gas money and spend it on everything else? At best, they drank some of it. I have a strong suspicion the recovery is finally over and that 2015 will mightily surprise economists to the downside. If so, it's fitting the party would end on the recent upward GDP revisions.